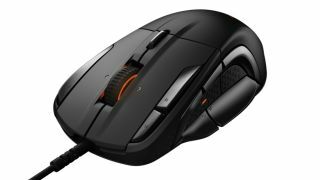 SteelSeries has released a new mouse pitched at the MOBA/MMO genres which the company claims 'reinvents' the mousing experience for players of these highly competitive games. With the Rival 500, the company has essentially thought carefully about the placement of multiple buttons to ensure that hand movements and clicks are as natural and 'efficient' as they can be. And there's also an emphasis on the mouse being comfortable to hold, which doesn't hurt. So the peripheral is designed with natural hand movements in mind, featuring curved buttons on the side that can be activated with a simple flick-down motion of the thumb, for speedy clicking. There are also a number of carefully positioned buttons on the top of the device for easy access to commonly used controls such as mounting up. The main left and right mouse buttons have been fashioned from reinforced plastic to make them more durable, and to give both these buttons a more even and satisfying (not to mention consistent) clicking action. The other major innovation SteelSeries is touting is 'tactile alerts' – in other words, vibrations through the mouse that can be set up to trigger when something happens in the game (though the company has already used this system in previous Rival models). So the mouse can produce a particular kind of buzz to let you know when a cooldown has reset, or your health is running low so you need to hit that crucial heal. Or indeed if you get stunned, you can have the mouse buzz your hand for the duration of the effect, so you know exactly when it expires. The tactile feedback can consist of all manner of different types, from short through long buzzes, to different speed pulses and so forth. All that should be pretty handy indeed for those times when the screen is so busy you might miss some crucial piece of information. Also on the customization front, the mouse includes lighting effects with RGB illumination boasting some 16.8 million colors. As for the core specs, there are 15 buttons on the Rival 500 (which are rated for 30 million clicks), with an optical sensor that offers a sensitivity of up to 16,000 CPI. You can purchase the mouse right now for $80 or €90 (around £75, AU$135) online and that price includes shipping.